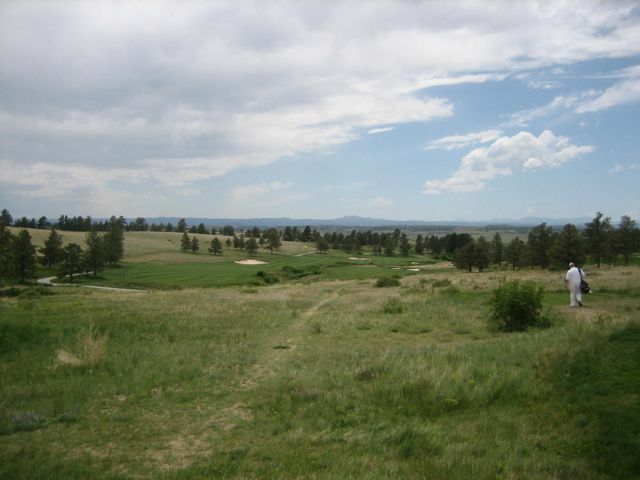 Colorado Golf Club is one of the most extraordinary golf showcases of the Colorado Front Range’s vast, wide open spaces. Here, the split fairway par-5 16th. Every architect’s ideal scenario is to be able string together unlimited variations of holes on a vast, moving, unencumbered property. Bill Coore and Ben Crenshaw’s boundless opportunity at Sand Hills comes to mind when we think of the ultimate example of man vs. wild golf design. In other situations, limitless freedom across a property can be anything but liberating. Few places anywhere have features and elements as relentlessly homogenous–and perfectly suited to golf–as the Sand Hills site. Just because the proposed landscape is vast, if it possesses broken sections and a variety of settings and landforms, finding and building a united, thematic 18 holes can be confounding; there aren’t many possible missteps in running holes through a preordained housing project, but on a great site options can overwhelm the potential. With great freedom comes even greater expectations, and a greater chance to misfire. Still, it’s a hell of a problem to have, and Coore and Crenshaw can count themselves among the very few working designers who even know the frustration. At Bandon Trails, the challenge was to craft a seamless routing through upper dunesland, lush meadows and mountainous conifer forest. Each microenvironment is individually some of the most stunning golf land imaginible, but creating a page-turner using all three together would constitute one of the highest achievements for an architect. 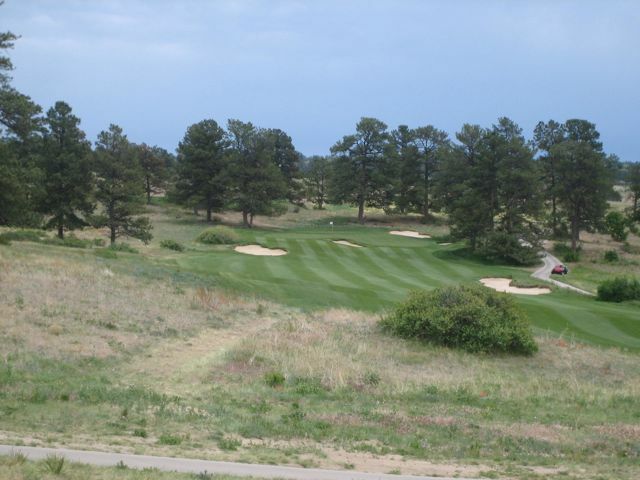 The opening tee shot at Colorado Golf Club–we’re off! 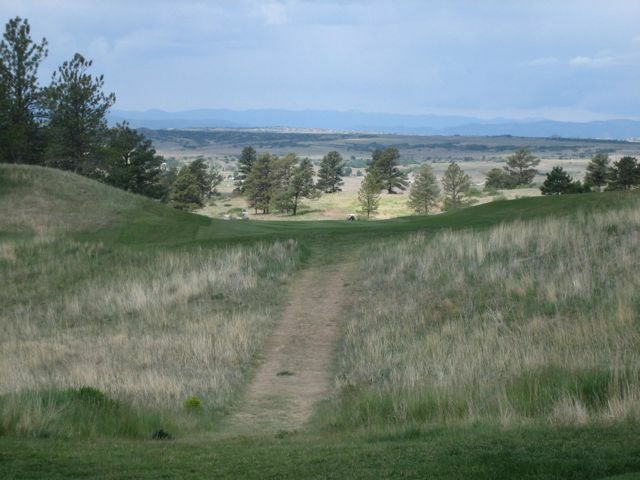 Colorado Golf Club, in the arid badlands southeast of Denver near Parker, is a similar case. Again, Coore and Crenshaw faced an enormous, interesting property and freedom to roam. But like Bandon Trails, it was divided into three distinct sections: an elevated upper ridge; steep, lightly wooded transition zones; and lower prairie cut with arroyos and ravines. The holes themselves encompass some 260 acres, roughly the same as Sand Hills, but they span over 100 feet of elevation change from high point to low. 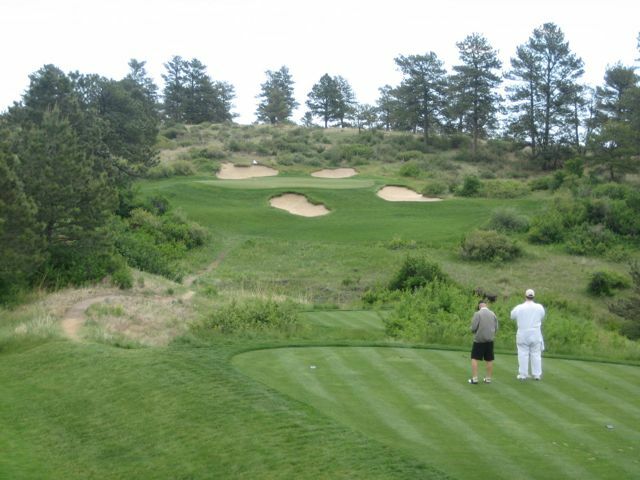 The round blasts off with a cascading par-5 of 653 yards (this is at mile-high altitude, remember), then a short one-shotter to a green benched into a woodsy hillside, and then a par-4 with a blind tee shot over a diagonal ridge that runs down to a green fronted by a sandy gulch. The second is a tasty, natural par-3 of 125 to 150 yards. It’s a lot of golf packed into three holes, and it illustrates the majesty of the site as well as the challenges. Somehow the different zones must be traversed and integrated–when you come off the high ground, you have to somehow get back up. For the course to work as a whole the transition holes from the upper ridge to the spacious prairieland must not be just elevators between the two but key plot points in the overall story. The routing does this by breaking up the sloping region into segments: the short par-4 8th with a spicy little green climbs the first section of one flank, and the tee shot on the broad ninth gets the rest of the way up. The 10th, a classic hi-lo Colorado par-4, slides back down into a graceful, bunkerless green, and so forth. The only transition hole that doesn’t work is the 18th, a long, hard sludge up the final rampart that’s a letdown as the finisher. A wild, elevated and curved green at the 8th adds interest to this barely 300-yard hole. 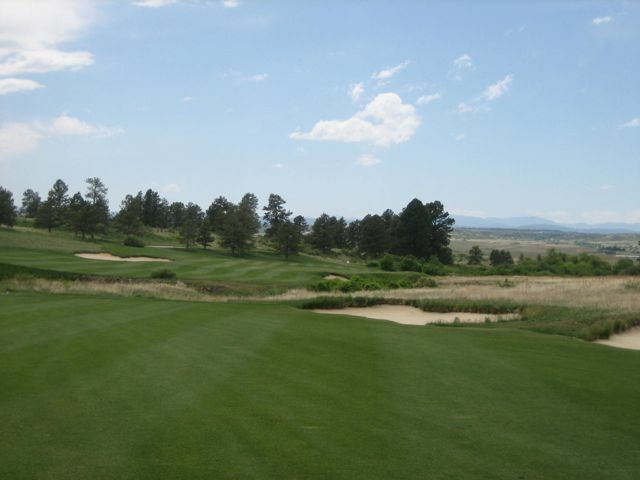 The lower holes is where Colorado Golf Club really shines. The open land along the gulches and prairie grasses allows Coore and Crenshaw to do what they do best, and that’s showcase subtle ground movement ( or in the case of the 15th hole, not so subtle), provide width, and within that width create strategic playing angles into the large, low-profile greens. One suspects that they viewed the upper holes as evils necessary to get down to the really good land below. Holes four through seven are each powerhouse standouts with open fairways and large, heavily contoured greens. On the second nine, the strategic par-5 12th ignites a memorable run that includes a drivable par-4, a gigantic par-5 with an unusual heaving fairway, and one of the best holes I’ve ever seen, the par-5 16th with a split fairway (a type of hole Coore and Crenshaw are quite fond of) and a kick slope that feeds everything down into a deep green banked against a gully. The drivable 14th, with its boomerang green, fits perfectly into the natural landscape. If Coore and Crenshaw have built a better set of par-5’s than they did here, I haven’t seen them yet. They each utilize bunkers, gulches, views and every point of natural interest in the ground, and range from the highly strategic (7th, 12th and 16th) to the gorgeous (1st) to the slightly bizarre (15th). On a site that’s typically windy and blustery, they provide an infinite variety of options and outcomes. The second shot on 16 gives you the idea of the cant of the ground and the scenic vistas of CGC.